Why the Apple Watch Will Never Have a Camera – Sanspoint. Apple’s September 7th event is just around the corner, and it’s looking like it’ll bring an upgraded Apple Watch 2. As part leaks and official rumors trickle out, the rumor mill has quieted about adding a camera to the Watch. Despite this, I still hear people insist that at some point the Apple Watch will have a camera. It’s just a question of when. I’m trying to be more open and less skeptical about technology things I don’t get, but this seems ridiculous. I’m going to make a claim right now that the Apple Watch is not going to get a camera. Not in the Apple Watch 3, the Apple Watch 4, the Apple Watch SE, or the Apple Watch Air. It’s not going to happen. Though to protect what credibility I have, this claim chowder will expire after five years, if only because five years from now, we might be gossiping about a completely different Apple product’s upcoming features. Also, this claim chowder does not cover the idea of Apple adding a camera for iris recognition to unlock the device. While it is, technically, a camera, iris recognition uses near infrared illumination to work. Visible light hides the important structures of the iris that are needed for identification, especially for dark-colored eyes. You’re not going to be taking selfies and FaceTiming with an iris recognition camera. I’m sorry. The biggest clue that Apple isn’t going to be adding a camera to the watch is the recent repositioning of the Watch as a tool for fitness and quick information. Messaging was part of the original Apple Watch pitch, but Apple’s marketing has shifted away from that since watchOS 2. The features in the upcoming watchOS 3 put the nail into the coffin of the Watch as a primary messaging device with the removal of the goofy circle of friends UI for the side button, replacing it with an app dock. Apple wouldn’t have done this if the Watch were going to stick with messaging as a primary use. Even if it messaging gains prominence in the future, a camera would still be a dumb idea for a bunch of reasons. Here, try an experiment. Hold an iPhone against your wrist, putting the front-facing camera approximately where the face of an Apple Watch would be. Now, hold your arm up and try to take a good selfie. Bet your arm gets pretty tired, pretty fast. Imagine trying to have a FaceTime conversation like this. There’s a reason people don’t hold watches up in front of their face. We tend to look down at them, raising our wrists about halfway. It’s a much more comfortable position. So, try taking a selfie with your iPhone front camera resting where your watch would when you look at it like a normal person. Now, count your nostril hairs. Not to mention, there’s the creepshot problem. A small, wrist-mounted camera is the perfect device for taking non-consensual photos up a woman’s skirt. If you don’t think this is a problem, it’s so prevalent in Japan that all cell phones have a shutter sound that cannot be disabled. That includes iPhones. Nostril-cam and creepiness aside, there’s also the problem of where the heck you put the camera in the first place. It’s not as easy of an idea as you might think. Most smartwatches with cameras tend to put them in the bezel, which is an easy solution that is loaded with problems. First off, where on the bezel do you stick the camera? 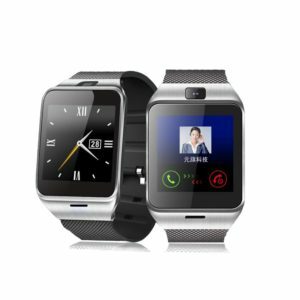 Smartwatches with bezel-mounted cameras tend to stick them above the screen, typically at an angle. This is so you can take a selfie, or a picture of something else, but it’s a compromise that makes for neither good selfies, or good photos. Plus, the Apple Watch is designed to be worn ambidextrously. 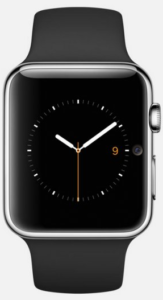 There’s a setting to flip the display so you can wear it on either wrist. A camera above the display when worn on the left wrist becomes a camera that’s below the display when worn on the right. So, maybe you put it on the left or right side of the bezel. Solves the orientation problem, but not the nostril-cam problem, and it’s not going to be good at all for anything other than a nostril-selfie. There’s also the Arrow Smartwatch which puts the camera in a rotating bezel. It’s an interesting idea, but it hasn’t shipped yet and doesn’t solve the angle problem. Plus, if you think Apple’s going to make the Watch round any time soon, I’ve got a glass cube on 5th Avenue to sell you. How about a second crown with a camera in it? Then you can rotate the camera to point at yourself, or whoever you’re taking a picture of. An interesting design idea, but impractical in practice. You have to limit the rotation of the second crown to 180 degrees, lest someone take a poorly lit photo of their wrist. It’ll also have to stick out quite a bit to not capture the side bezel of the watch in every photo. Having a connection between the camera and logic board that doesn’t break after extended crown twiddling is difficult. And it’s not hard to imagine confused Watch owners trying to twiddle the wrong crown to scroll the screen. This leaves one last option: a camera in the band. It’s not only plausible, it’s been done. 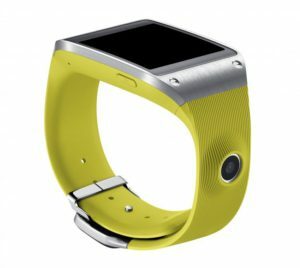 The original Samsung Galaxy Gear included a watch band with a built-in camera. Not a good camera, but a camera none the less. When you think about that secret diagnostic port on the inside of the band connector, it’s not hard to imagine some kind of special Apple Smart Watch Band with a camera that hooks in. Even this has huge issues. First off, remember that the Apple Watch is ambidextrous by design. 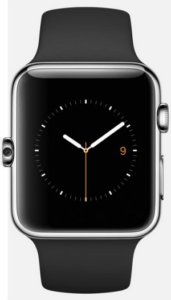 If Apple wants to release a Watch band with a camera in it, it’ll have to be usable on both the left and right wrist. It would be a very dumb and dangerous idea to have the camera connection run through the band’s clasp, so a future Apple Watch would need to have two connectors, one on each side. 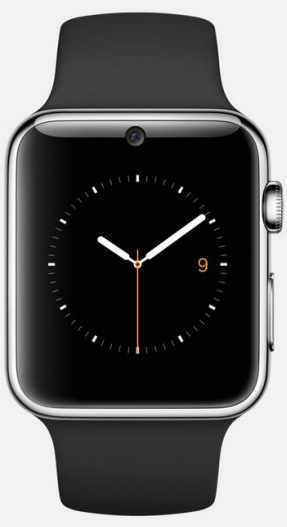 I’m willing to bet Jony wasn’t too happy about having one port on his Watch, let alone a second. Besides, it’s been a year and a half, and Apple’s yet to announce any official use for that port. Unless something hooking into it gets announced on the 7th, I wouldn’t get my hopes up. And how do you take a selfie with the camera mounted on the watch band, anyway? I know Apple’s got some very clever people in their Industrial Design and Engineering teams. I’m sure one of them is probably clever enough to figure out how to put a camera in the Apple Watch in a way I haven’t thought of above. Problem is, clever isn’t the same thing as useful. Apple isn’t the sort of company that’s willing to compromise usability, design, and quality just so they can check off another box on a list of features. You’re going to be taking photos with your phone for the foreseeable future. Get used to it. If you want the experience of photography on your Apple Watch, the remote shutter feature still works.